It's Meatless Monday again, and I have to confess that I am really excited about today's recipe. You see, I never want to be content with my flavor palette. I am consistently trying to grow and develope it. This summer, while shopping at the Point Park Marketplace, I came across some lovely beets. As a child I had tried beets out of a can, but I will confess I didn't care for them. 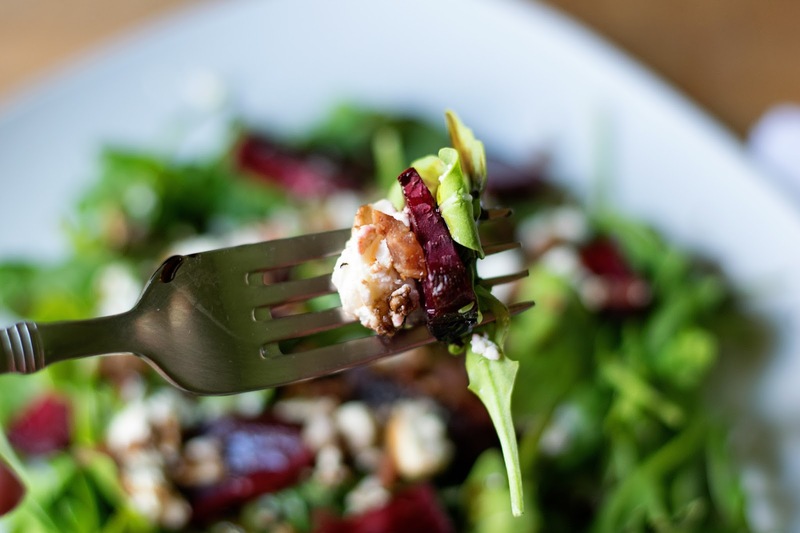 However, I think everything food deserves more than one chance so I bought them and decided I would made a Roasted Beet Salad with some peppery arugula, salty feta, and a drizzle of fig balsamic vinegar. Oh my stars! It was absolutely delicious and I can't wait to share it with you. As I mentioned previously, I have never had beets that were not in a can. Therefore, I had no idea how to prepare them. So I talked to a couple of my foodie friends and both of them recommended the same technique. The first think you will want to do is thoroughly scrub your beets. Next, cut the tops and bottoms from your beets. Then slice them in half. I will tell you that beets are very "inky". You may want to use gloves, and DEFINITELY use and apron. Afterwards, place them on a lined baking sheet. And drizzle them with a little extra virgin olive oil. Now you will put the baking sheet in a preheated 400 degree oven for 20 min. Once finished, they will look like this. Now, you can cut them into think slices for the salad. You will notice that I did not peel the beets. I felt that the skin was thin enough that it did not affect the flavor, and that is where a large portion of nutrients are at. However, if this is displeasing to you, feel free to peel them after you remove them from the oven. It will rub right off with a paper towel. Now you simply place a layer of arugula on your plate (you substitute spinach for arugula if you like). Sprinkle the feta over your greens. Place the beets on the salad. And finally, drizzle with the fig balsamic vinegar. You should be able to find this at your local grocer, but if not, regular balsamic is fine. I broke the meatless Monday rule just a little and added some real bacon bits. All I have to say is that the spiciness of the greens, with the saltiness of the feta, combine with the sweetness of the beets, and the tang of the vinegar is something that had to be orchestrated by the food gods. It was absolutely delicious! I DARE you to make this tonight! I have a feeling you will never look at beets the same way again. Cut the tops and the bottoms of the beets. Then, slice them in half. Place the beets on a lined baking sheet. Drizzle with oil, and season with salt and pepper. Place a layer of arugula on a plate. 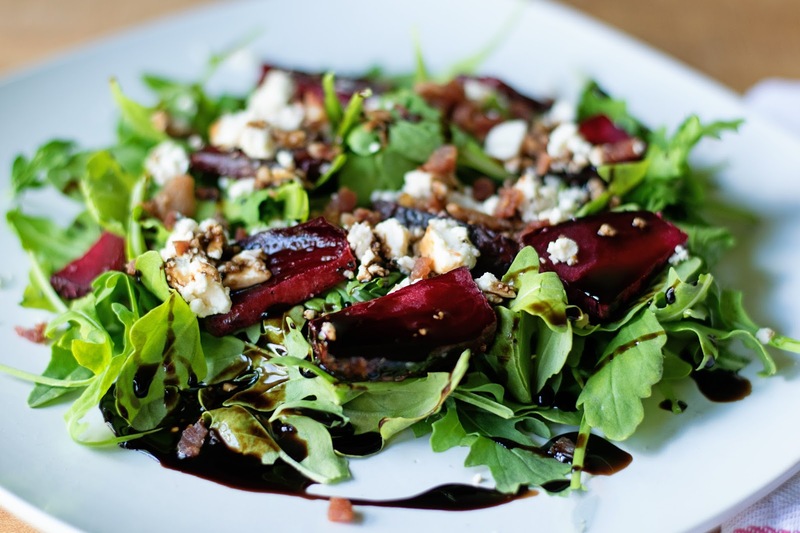 On top of the greens you will place the beets, sprinkle the feta, and bacon (optional). Then drizzle the vinegar over everything. *You can use spinach instead of arugula. 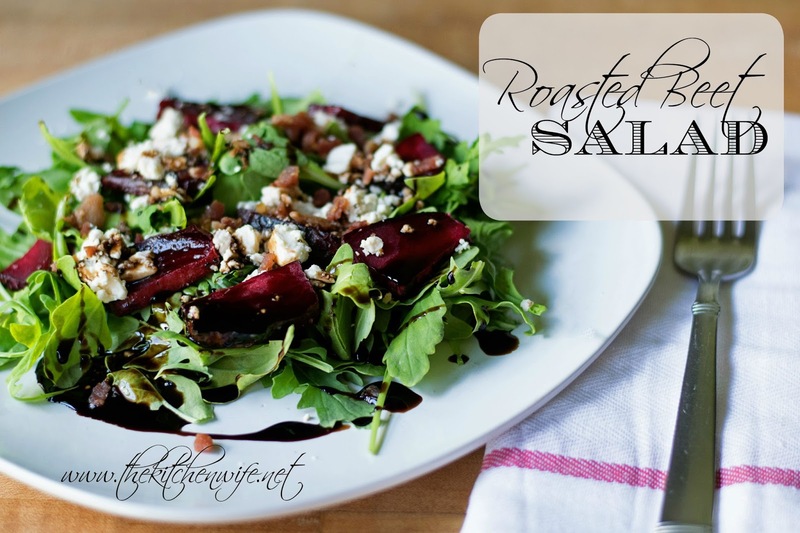 **You can use regular balsamic vinegar.